Matthew and Beth are here this weekend. They arrived yesterday night and we went to dinner then I crashed. I had worked a long day. Beth had also gotten up very early too. On Saturday I got a haircut, then Matthew and I picked up my race packet for tomorrow. He signed up for the race tomorrow too. After shopping for some junk food they watched Texas A&M play Texas Tech. Heather, a friend of Beth, arrived to watch the game too. So Kathy and the crowd were downstairs screaming at the TV while I’m upstairs at the computer typing this. We enjoyed pizza and ice cream. However, it wasn’t A&M day and they lost. The Matthew and Beth have gone out to a movie and it’s just me and my sweetie. We’re having a good time, but we’re just old folks. I hope they find our home relaxing territory. It seems that each year I find myself weakening. Recently I was trying to move things around the house and I just had a hard time doing it. It seems that I just don’t have the muscles I used to. Now don’t get me wrong, I still have some, but I can tell now that they’re not what hey were. Now you might say that if I can run a marathon I must be fit and strong. Nope, this past year I’ve run my fastest marathon and now in class I’m no where near the speed I was just six months ago. Getting older and slower stinks. This also includes the muscle between my ears. Each year I’m getting slower there too. This aging process is quite interesting since I know that at some point I’ll lose enough gray matter that I won’t be able to realize that I’m losing it. That’ll be the day when I think I’m OK, but in actuality I’ve lost the self perception of my own capabilities. That’s lovely. Just great. I’ll be a vegtable but again happy because I won’t have the cognitive skills to realize it. Sheesh! Be warned y’all that that time is just around the corner. So if any of my children, family or friends read this know that I love you and that I’m a quiet positive gentleman, but know full well that someday in the future I’ll be a angry, vocal, disgruntled cucumber or whatever (fill in the name of your favorite vegtable). Matthew stopped by this weekend. He didn’t really want to see us, but hey we can buy him stuff. Right? Right! So after a stop at Micheals and four picture frames later we returned home to dinner and football. I cooked steaks, baked potatoes, and green beans. Why did I say he didn’t come to see us. Because all he wanted to see what his sweetheart. So late on Saturday Beth and her dad stopped here. They had just driven in from Indiana. A very long drive. Her father continued on to San Antonio while Beth stayed here overnight. Today we went out to the local Pancake House for a delicious brunch. Now we’re just bummin’, watching football, and they’re snugglin’ on the couch. After my Saturday morning long run and Kathy’s yoga class we drove over to College Station to visit Matthew. He had a few jobs around his apartment for us to do. One was reattaching his dishwasher to the counter. The particle board of the counter had begun to disintegrate so we reinforced it with a 2’x1″x2″ pine strip and glue. Also Matthew had punched a 3″x8″ hole in his bedroom plasterboard trying to pound in or pull out some nails. So we got some joint compound and some small pieces of plasterboard to cut out the bad section and fill it in. We went out to the Texas Roadhouse for dinner with Matthew friend Sabrina. We had a nice time chatting. Matthew rented some DVDs and we watched “Akeela and the Bee”. 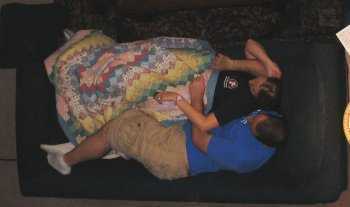 That night we slept in his living room on the couch and Aero-bed. The next day we finished up the jobs from the previous day and watched “The World’s Fastest Indian”. Also Kathy and Matthew bought medium blue curtains; for his bedroom, for the small window near the door, and between his bedroom and living room. The latter required a shower curtain rod and mounting some brackets too. Just after dinner on Sunday we returned home having enjoyed ourselves and feeling very productive. His apartment is now even better. You are currently browsing the Watt's Up blog archives for September, 2006.